Hello everyone! This will be my last post for the semester! Thank you again for following along with my journey this past semester, it has been very enlightening. For this post I am going to be talking about one of the topics I found interesting that we covered in class. The topic I am going to be talking about will be multitasking. This topic stood out to me the most because it is something that I try to do often, especially when it comes to schoolwork. I have always multitasked throughout the years as a student. I never truly gave it too much thought into thinking twice about doing it because I always assumed that by multitasking I was getting the same work done in half the time it would normally. I also thought that my work was at the same level it would be normally if I just focused on one task at a time. During this class period I was proven completely wrong! After doing more research on the topic I realize just how wrong I was to think I was doing work in half the time and it was high quality work. The first article I found named “Effects of multitasking on retention and topic interest” by Muhterem Dindar and Yavuz Akbulut. In this article they take a closer look at the effects of the type of multitasking students use and what that does to the student’s retention and interest in the topic. This is what they found, “These findings suggest that the type of multitasking scenario may interact with the nature of the instructional content in influencing affective consequences. In addition, concurrent multitasking seems to interfere with affective outcomes in certain topics whereas sequential multitasking does not.” They found that their interest levels and retention were affected by the type of multitasking they were doing. 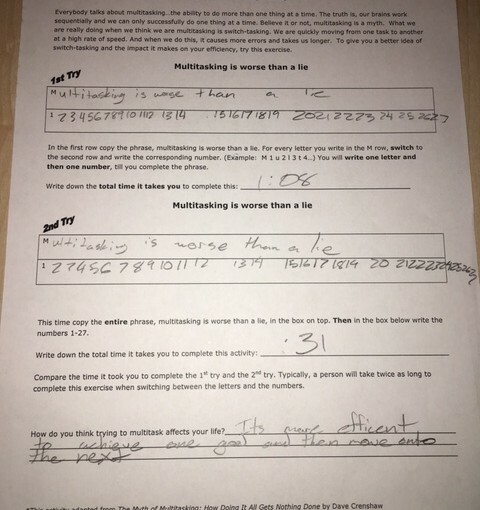 If the student used sequential multitasking or concurrent multitasking, using sequential multitasking this is when students alternate tasks they are trying to do. In concurrent multitasking students perform at least two tasks at the same time. They found that neither groups performed as good as the control group, however the scores were higher for both, retention and interest, for sequential multitasking. This is because students were focusing on one task at a time, even though they were going back and forth, instead of trying to do two tasks at once. In a second article I found titled “Learning variables, in-class laptop multitasking and academic performance: A path analysis” by Weiyu Zhang. In this article it looks at how letting students have a laptop in class can affect their academic performance, like the title suggests. The study found, “In other words, when two or more cognitive tasks are being performed simultaneously, there will be decrements in performance in at least one of the tasks. In the case of laptop multitasking during lectures, students work on not only the task of listening to and understanding the lectures but also other tasks such as note-taking, surfing webpages, searching for other information, using SNSs, IMing, and so on. 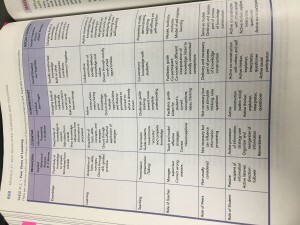 The multiple tasks compete against each other for the limited cognitive capacity students possess and therefore, lead to poorer performance in a midterm exam that heavily relies on the lecture content.” This is a long quote, however it proves the point that I found out in class this semester. When students try to multitasking, their performance drops and they are not putting forth their full concentration and effort to each task. Then they added a laptop in front of the student, and as expected, they used the laptop to message each other. This causes another task they are trying to accomplish on top of all of their schoolwork. They proved that this is too much for the brain to handle, and as a result students’ grades fell. In another article I found named “Cognitive Predictors of a Common Multitasking Ability: Contributions From Working Memory, Attention Control, and Fluid Intelligence” composed by Thomas S. Redick and many other authors. In this study the subjects completed tests to see if there was a correlation between working memory (WM), attention control, fluid intelligence, and multitasking. The study showed, “Finally, when analyzing the subcomponents of individual differences in WM that are critical for multitasking, we found that capacity and attention control fully mediated the WM and multitasking relationship.” This means that if someone’s attention is on something besides the task at hand his or her working memory, vital to multitasking, cannot perform its function efficiently. This again backs up the idea of multitasking not being the faster and more efficient way to doing schoolwork. During the in class lesson we worked on a worksheet that tested our multitasking abilities. I will put a picture of the worksheet above. This worksheet asked us to write out a sentence and count the words by writing them down at the same time. I was twice as fast focusing on writing the sentence, then writing the numbers down instead of doing them at the same time. This furthers the point of how multitasking can decrease efficiency because our minds will be overloaded with too much information. My final thoughts on multitasking are that based off of the evidence I have presented you is that multitasking is not the more efficient way. Students need to focus on one task at a time, as teachers we need to focus on one task before moving onto the next, otherwise our students will not perform at their best! Thank you for reading the blog, have a great day! Akbulut, Y., Dindar, M. (2015). Effects of multitasking on retention and topic interest. Learning and Instruction, 41, 94-105. Engle, R. W., Hambrick, D. Z., Hicks, K. L., Kane, M. J., Meier, M. E., Redick, T. S., Shipstead, Z., Unsworth N. (2016). Cognitive predictors of a common multitasking ability: contributions from working memory, attention control, and fluid intelligence. Journal of Experimental Psychology, 145(11), 1473-1492. Zhang, w. (2014). Learning variables, in-class laptop multitasking and academic performance: A path analysis. Computers & Education, 81, 82-88. Hello Everyone! In this blog post I will be reflecting back on all the things I have learned this semester. I have learned a lot this semester that I can take away as I continue on this journey to become a teacher. One big concept I learned this semester was how to become an effective teacher. At the beginning of the class I only thought that a teacher should be fun, knowledgeable, be able to mange their time, and some other important characteristics. Now I realize that teaching is all of that and so much more! It involves pedagogy, Bronfenbrenner theory of how outside factors affect students, engage the students in learning, being prepared and organized, and build a connection with the students. How I perceived a teacher to be effective has not necessarily changed, but I have added things to what an effective teacher needs to be doing. One of the teaching standards that this class helped me with is, leverage information literacy to evaluate and select information about students and teaching. This class helped me realize that there is so much more than just to teaching the students. You need to know where the school is at, what the home life is for students, where are the students cognitively, and how does all of this affect their schooling. The most significant thing that I learned this semester is teaching is an art, or known as pedagogy. Not everyone can teach, compared to popular belief, there is a certain way to teach students in a way that they will engage in and learn what you are teaching them. There should be a connection between the teacher and the student; I also learned this from my Observation and Practice, when my teacher had students go out of their way to say hi to her. These same students are the ones that look forward to her class and that is half the battle with a student is making them want to come to class. As I continue on with my career to become a teacher I plan on keeping my online identity by continuing this blog and make sure that my social media presence is positive. I also plan on gathering materials from all of my classes, and organizing the materials, so that I can use them when I am teaching my own class one day. Thank you so much for reading my blog posts and make sure to check back in soon! Hello everyone! For this post I am going to be talking about Backward Design, motivation, assessment, and goals. In class we have been learning about backward design, at the bottom is an example of backward design that I came up with during class. This is about starting with the end in mind and figure out the bigger questions that the students should be able to answer at the end of the unit from everything they have been taught. I like this design because instead of worrying about what drills or specific activities I might conduct with the kids, it makes me think about the bigger goal of the lesson and the unit. With this it allows me to get the goals, or expectations, I will have for the students to take away from the lesson. With the backward design it comes with different assessments that can be done with the students. Assessments in school, for me, have always been either taking a test or writing a paper. Also, for Physical Education that has been if I showed up to class dressed correctly, participation, and if my fitness levels meet the requirements. There are a lot more ways to be assessed than just these. One assessment that I hope to use one day is a portfolio assignment. This is where students at the beginning of the class come up with goals for themselves they want to achieve short term and long term. The portfolio will include different assignments such as what the student eats, exercise, how much time they watch TV, etc. This is assignment I hope will be able to let the students take what they learned and use it each day for the rest of their lives. With what I described above, I hope to motivate students to strive for their goals. They need to be able to make goals on their own and be their biggest advocate and get themselves motivated, with some help from their teacher, and go out and achieve what they want to achieve. I hope when I become a Physical Educator I can help motivate my students to help reach the goals they set for themselves. From this maybe students will start to use this in their everyday lives and take it with them for the rest of their life. · Be able to demonstrate good technique while passing, dribbling, and kicking. · Why do we have to dribble? Exit slips with certain questions that can be asked abs students have to fill out (Or maybe even a journal entry) . These exit slips at the end will include the essential questions for the whole unit. Making sure students are using skills that they were taught correctly. Making sure all students are participating and giving their best effort. Where- Help students be good with their feet and coordination so these skills cab transfer over. Pre test to see where the students are at skill wise. Hook- A game of their choice. Equip- Through Drills they will learn these skills and be able to use them in the future. Rethink- Different ways they can possibly do the skills, through different drills than what was used, and even possibly give them new skills they can use. Organized- Have teams constantly work together during all the drills, so they build team chemistry. Hello everyone I am back again! This week I am going to address different differences I may encounter among those I may work with. For both those who I work with and the students, who I will someday, be teaching. Teaching is the same as most jobs, in regards to having lots of different cultural differences in the workplace. I expect that in education that I will have a lot of co-workers that come from many different backgrounds. I need to be able to put myself into my co-workers “shoes” and notice their differences and be accepting of them, just like how they have to understand mine. I plan on accepting and personally identify all of the different cultural backgrounds that my students may have. I also plan on making sure I know that I am aware of certain cultures and make sure that I do not offend anyone in my classroom. One difference I think will still be relevant when I am teaching is race. The biggest way I can prepare for this is accepting that different races have different cultures and understand each person has a very different life. Then students get racially profiled each day to add to their stress levels already. I think the biggest part of easing that stressor is by treating them like everyone else, but also realizing that each student has a different life, which can be impacted by race. While being a teacher I will have to make sure that I am very aware of the different cultures students are raised in. Hello everyone! This week is our Module 3 post and I will begin with talking about the differences between behaviorist and cognitive perspectives of learning. The differences are, the cognitive perspective is knowledge and strategies that are learned then changes in knowledge and strategies make change in behavior possible. Meanwhile, behavioral perspective is where the behaviors are learned themselves. The important part of these are that behavior views help maintain that reinforcement helps strengthen responses, while cognitive view that reinforcement as a way to find information about what is likely to happen if the behaviors are altered or stay the same (Woolfolk, 2014). It is important to apply these perspectives of learning to instruction because they can help teachers change or help strengthen certain behavior. A teacher can use reinforcement to strengthen a behavior, however if a teacher wants a student, or students, to change their behavior then the teachers can use the cognitive perspective to see the potential of how the students will respond. There are, however limitations to these perspectives. The limitations are that the perspectives are based off of inferences and not on set facts. Since they are based on assumptions means that it cannot be made for sure whether a certain outcome will happen for sure. The view that I think I will use more in the classroom will be the cognitive view. I will use this because it will be based off of previous experiences or actions that can help me decide what might happen if I give certain reinforcement. 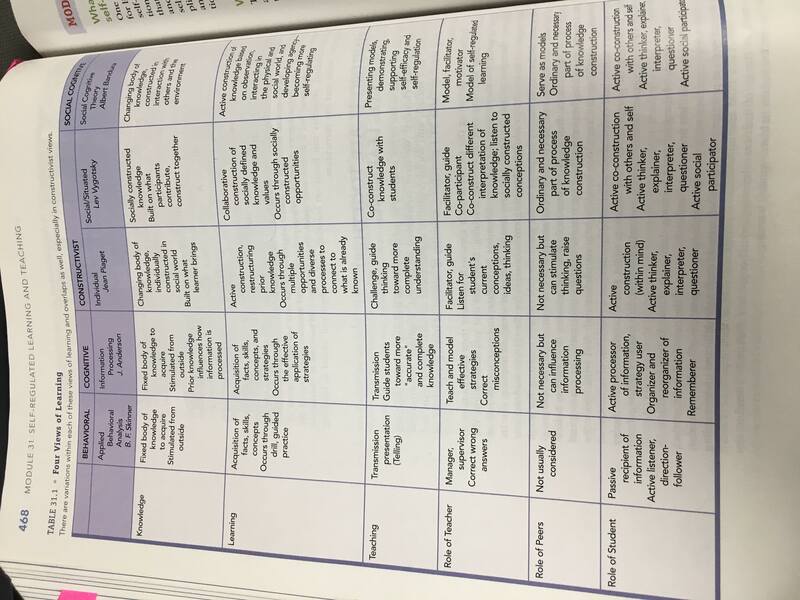 I have inserted a table from our textbook. In this chart I believe I fit into the cognitive and constructivist categories. These categories fit me best because I like the idea of having students learn in the classroom and then apply what they learned to situations outside the classroom. This will give them the creative possibilities of problem solving and coming up with unique answers to unique questions. For Physical Education this could be seen in an Adventure Education format where students are told how to set equipment, such as camping for example. However, with the changing weather students have to figure out how to more efficiently set up their equipment. As a future educator I want to make sure that I challenge my students and what they are capable of doing. Having the students in groups for certain activities also allows them to collaborate with others and challenge each other in order to play to each other’s strengths. So, the views of learning that I believe in the most are Cognitive and Constructivism. Thank you for reading this week’s blog! Hello everyone! This post will be talking about developmental characteristics and how that affects teachers teaching the students. It is very important to know where students are at developmentally so the class is not too hard or too easy. Finding the correct difficulty is something we addressed in class and found very important. If the content is out of reach of the student they will be more likely not to pay attention, and the same can be applied to a class that is too easy. Also in a previous post I stressed the importance of assigning the right amount of homework to students. This ties in with not making the class too hard because if a student is struggling in class and tries to do the problems on their own, they are going to be very discouraged. As educators we need to be encouraging not discouraging our students. With trying to determine where students are at cognitively, we can use Piaget’s theory of four stages of cognitive development. There are different types of cognitive tests to see where children are at in these stages. They are described in the video I have linked that I highly suggest watching. There are other things outside of school that can affect student learning. This is expressed through Urie Bronfenbrenner’s model of how certain things in a student’s life can affect their schoolwork and personal lives. The picture I have added is his model for what affects a students’ life. An example of this would be the parenting style of the person who is raising the student. Depending on the style of parenting the child is receiving will determine how the student will learn. If the parent is very strict the student will be more likely to follow structure. Where as some one who is raised with less rules might respond better to be more creative and doing things a different way than just following a strict structure, or they may need even more structure depending on the student. This can be demonstrated in the popular TV show “Modern Family.” Claire and Phil Dunphy raise their children with some less rules then some parents when Alex does really well in school and can structure her life. While Luke and Haley on the other hand needed more structure in school because they were too used to doing what they wanted. This show is just one example of how parenting can affect the student in school. I encourage you to take notice of this in your favorite family TV show the next time you watch. The benefits of cognitive theories such as these are that it gives the teacher a greater understanding about where their students’ are at cognitively and personally. The limitation of this is that this then puts students into groups and starts to section off the class. However, in the future this can possibly used to have students help each other and challenge each other. This way the class wouldn’t be sectioned off; it would include group work across different levels of abilities. Hello! This blog post is going to be about research and how it is used for teaching. There are great benefits to using research in the classroom for teachers. Research can help identify teaching methods that are being used and evaluate whether or not the methods are working or they are not. This could be done using either quantitative or qualitative research. We can use test scores as a measure to see if the students are retaining the information or the students could be interviewed about what they learned and see if they can articulate it correctly. Also if I were a teacher I could use information literacy to seek out research to see if how I am teaching the students is a correct way or I could be doing better. Some examples could be the use of video games in the classroom, is it bad to assign to much homework, new games that can help students be challenged across the three domains (psychomotor, cognitive, and affective), etc. What all of this means for my future career is that education is changing fast and the way we educate kids could drastically change in 5 years even, because of the research that is being done. Such as finding out that giving a student to much homework can lead to stress and having imbalance in that student’s life. My take on this would be that this is a step in the right decision. In an article the research found that homework does not have a significant effect on a students final grade (Maltese, Tai, & Xitao, 2012). Another article found that giving a student to much homework could cause an imbalance in their lifestyle. Having so much homework some students found it hard to have relationships outside of school and had more stress in their life (Conner, Galloway, & Pope, 2013). 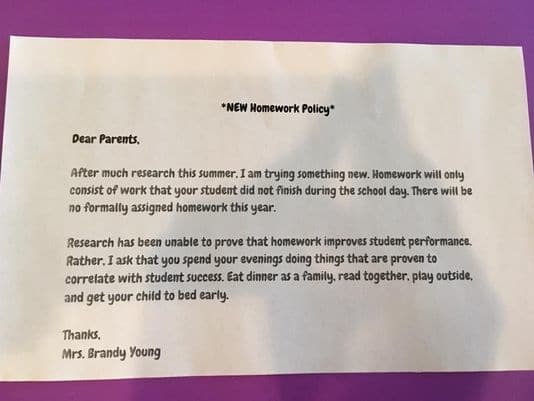 Some people may be opposed to not giving any homework, which I think there needs to be some homework, and Voorhees came up with an idea about homework. She suggests that students are assigned homework based on their ability rather than set homework for everyone (Voorhees, 2011). This is a great point to bring up because she later goes on to say it will decrease some of the frustrations students face when they have homework. In another study it showed the benefits of having homework, teaching students important skills such as, time management (Stoeger & Ziegler, 2008). This goes to prove that homework is not entirely a bad thing, however to much of homework can cause a great problem for students. Thank you for reading my Blog! Hello everyone! My name is Graham Hevel and I am a sophomore at the University of Wisconsin-Whitewater. My major is Physical Education and I hope once I complete college I will move on to be a teacher at a high school where I want to make all students more physically fit and teach them the importance of Physical Education. I got my inspiration to become a teacher in high school when I found that most of my mentors were teachers and I hope I can become a mentor to my future students. Another aspiration of mine, in addition to teaching, is to be a coach for various athletics at the school. A Chemistry teacher I had my sophomore year in high school I will always remember. He had qualities to him that I believe most great teachers have and they are passion for their subject area, caring, knowledgeable, and captivates the students. Despite not liking Chemistry very much, I looked forward to his class everyday. He did have some exciting demonstrations to help capture our attention, which then made me think of how he did the demonstration. Just like Mr. Wright in a New York Times YouTube channel, in the first couple of minutes of the video he talks about once he gets the student to keep on asking how or why he knows he will have their attention (New York Times, 2012). He is a fantastic example of what a great teacher is, the way he cannot only reach students on an academic level, but also a personal level. In our class we watched two examples of teaching on YouTube. The first clip I watched was a scene from Ferris Bueller’s Day Off, when an economics teacher is giving a lesson on “Voodoo Economics” (angelabroz87, 2010). While the teacher is giving his lecture students are falling asleep and find more interest in chewing their gum than listening to the teacher. I believe he does a couple things wrong and they are using a monotone voice, not getting the class involved, and throwing a lot of information at his students expecting them to remember it all. However, the second video is from Dead Poets Society and the teacher in the movie Mr. Keating is able to reach his students by getting students to view the material in a different way (love2b1, 2007). He reads Shakespeare to his class, but not in the conventional way. He gives the characters in the book the voices of modern characters, such as characters in movies, that way the students are able to connect with the story even more. This is an example of great teaching when a teacher can take something that students find not interesting and changing the way the material is taught so students become engaged into the lesson. love2b1. (2007, April 14). Dead Poets Society-3. angelabroz87. (2010, February 7). Boring Economics Teacher. Posted on January 18, 2017 1 Comment on Hello world!